Most flight schools understand the value of providing high-quality, accurate flight simulators as part of their flight training experiences. Flight Simulators are immersive, providing a realistic and relaxed learning experience for the student, versus books and drawings. Flight simulators reduce the workload and expense on any flight school’s most expensive activity – flight time in actual aircraft. Simulators will attract and retain students, keep your instructors current inexpensively all while increasing safety at your flight school. Your flight school has many expenses, and it depends on fees collected from students to operate. Your Part 61 or 141 Flight School needs a SEL rating and MEL rating simulator, but cannot afford to sacrifice authenticity or high investments. You need a FAA Approved simulator from a manufacturer that will work with you and your budget; while providing a better product than the competition. 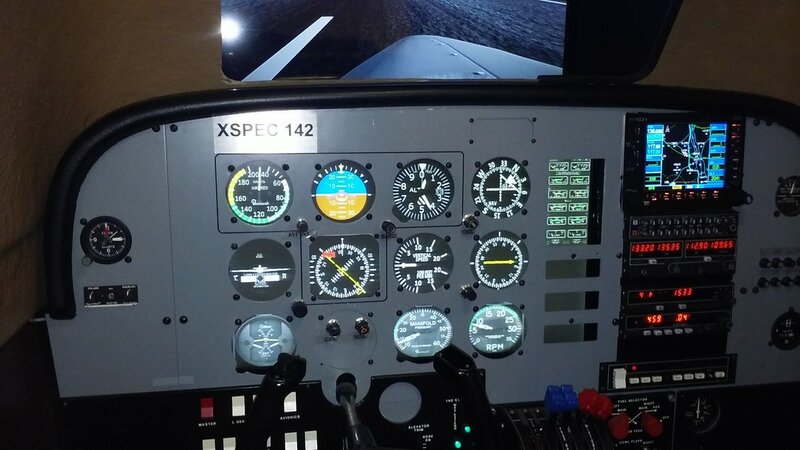 You need an XSPEC 142 for your flight school; re-manufactured to current training standards from the FRASCA 142- this unit is quality; at a fraction of the price you'd expect to pay for simulators from the competition. XSPEC Aviation noticed last year that many flight schools were taking a disturbing trend; one that aimed to cut costs- often at the expense of their students. In response, prices were dropped, to an all time low in the industry; in an effort to reduce training via unapproved devices in flight schools. 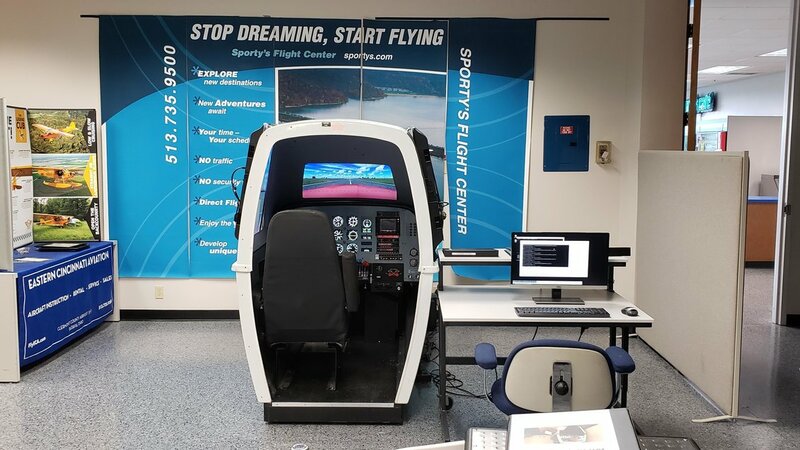 Flight schools all over have always seen the value in using flight simulation to teach students the muscle memory and coordination they need to become proficient pilots. However, a disturbing trend was beginning to take place- flight schools were beginning to build their own simulators. While this may seem lucrative to some at first, many will find that the result is a waste of money that fosters negative training. That's why, in 2018 XSPEC Aviation made flight simulation history by offering a new AATD for less than the price of a used popular "Red" AATD. Not only that, but they have made the XSPEC 142 more attractive than ever by adding an "Enhanced Visuals System". A visual system that rivals most FTD level simulators by covering almost 200 square inches with 180 degrees of accurate visual representation. 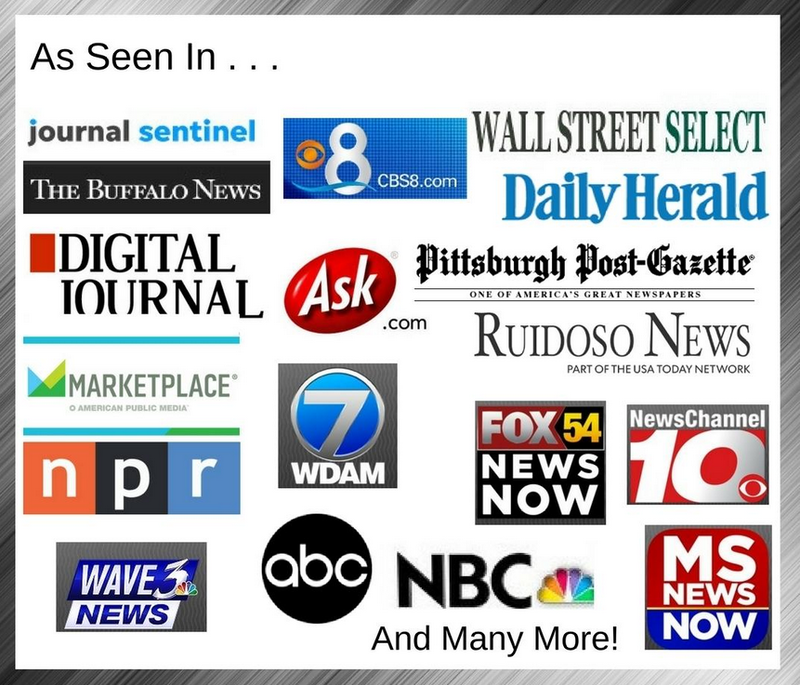 They launched all this at a base price of only $23,800- many people didn't understand how they were able to do it so inexpensively. Some competitors had to close their doors; and clients questioned the ability to do it at that price point. However, the ultimate goal was customer attention- and it worked. Flight schools from all over were taking notice, among them was "The World's Largest Pilot Shop" Sporty's (Academy). "We're happy to say we've managed to reverse the trend that we seen occuring; and it's become known that XSPEC Aviation is the remanufacturing leader in flight simulation." says President Aaron Hill. When owners of older Frasca units need a multi-engine AATD; XSPEC Aviation offers the most valuable investment in keeping an AATD in their Part 141 or Part 61 programs. "Because of the traction we've built, and the relationships we've formed- we've decided it's time to end our introductory period and revalue our units at their original price point, $34,800 (no core). As always, core owners will get a $5,000 core rebate on their XSPEC 142 AATD." says Hill. "As a technology-based company, we're always growing. Doing new, specialized projects and developing new solutions to aid the flight training industry" With this increase in price, XSPEC will be adding immense value to their units. "2018 was an amazing year for us at XSPEC Aviation. We've listened to your feedback, and are developing exciting new solutions that will certainly keep your flight school both obtaining, and retaining students." Their solutions are the epitome a neccesity based product; XSPEC will identify an issue or bottleneck and completely negate it. Whether it's financial or technical barriors in training device development, they've shown proficiency and success in their latest XSPEC 142 AATD. XSPEC Aviation is a flight simulator manufacturer that specializes in remanufacturing pre-May-2008 Flight Simulators (AST / FRASCA). They build training devices with the latest in modern technology on rebuilt AST/FRASCA cores. Because the hardware is rebuilt, they can provide a very high-quality training device at a much lower price than a new simulator. 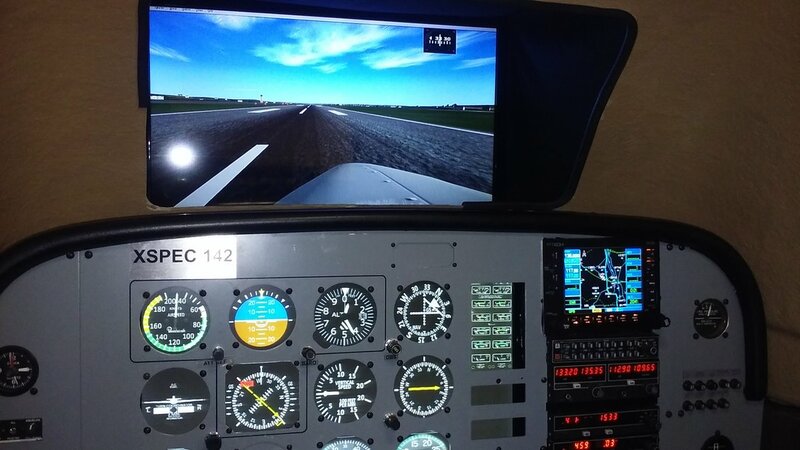 Flight Simulator re-manufacturer XSPEC Aviation LLC has been awarded a new, updated Letter of Approval (LOA) for their XSPEC 142 Advanced Aviation Training Device (AATD). Flight simulator companies depend on active, valid LOA's to allow flight schools to log hours of students use of their simulators towards pilot's licenses and ratings. Due to client demand for not only expanded visuals, but the need for more Piper aircraft was the driving force behind this new Letter of Approval. 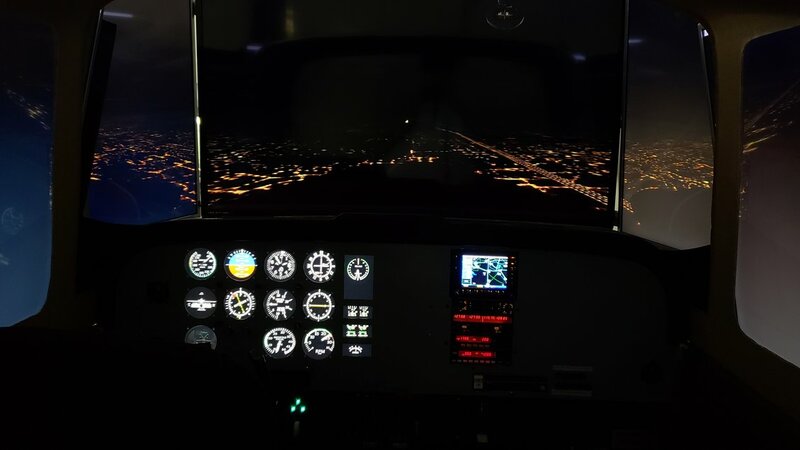 Now flight schools can purchase simulators that truly rival much more expensive, larger "projection-based" visuals flight simulators at a price that is still unmatched in the industry. "Most of the flight schools we called needed more Piper aircraft configurations" says Founder Bill Hill. As aircraft manufacturers like Cessna fail to meet the cost and availability demands of parts to maintain flight schools' fleets of aircraft, a shift to Piper aircraft has been noticed. Flight schools are finding it easier to keep their Piper aircraft in the air, and so they have become more popular among charter and training centers. "Since the beginning, we've always wanted to open up the visuals- now it's actually possible" says President Aaron Hill. It takes large amounts of CPU and GPU power to drive flight simulation visuals; which is why the original XSPEC 142 only has 3 visuals monitors. "It was sufficient, but not impressive in the sense that the Enhanced Visuals are". 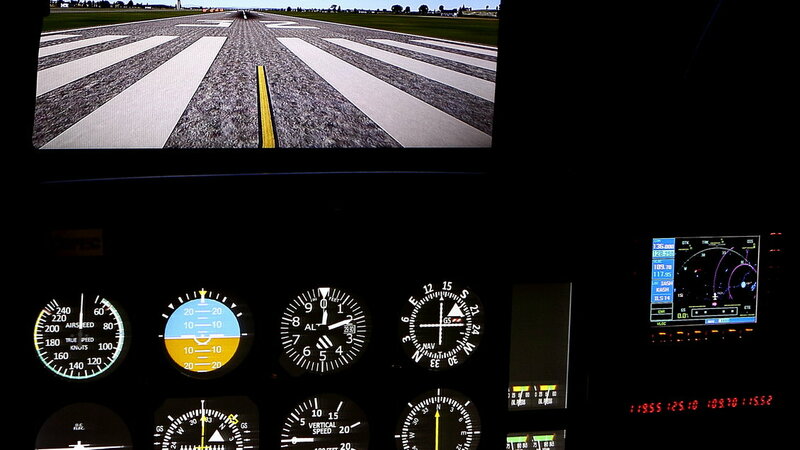 Flight schools rely on impressive flight simulators to give students a sense of training value and authenticity. Not only was the visuals updated, but a whole new avionics stack has been installed in the XSPEC 142 to add even more authenticity and value. "Our partnerships with companies all over the world allow us to achieve a simulator of this quality" says President Aaron Hill. XSPEC Aviation is an established flight simulator manufacturer, and the leader in flight simulation re-manufacturing. Flight schools recognize the value that flight simulators add to their training and bottom line. Among the many benefits it will provide to a flight school, one of the main advantages is the attraction factor. While it's commonly known that very high end simulators have "projection based visuals" the main disadvantage is the investment and space requirements. "Our (XSPEC 142) Enhanced Visuals competes with projection based visuals at a fraction of the price and footprint." Now, even small flight schools can afford to own very impressive flight simulators. The XSPEC 142 is a FAA Approved AATD that features 8 aircraft. The new approval allows for use of a visuals system that covers almost 200 diagonal inches, making it among the biggest visuals systems ever approved for a general aviation flight simulator. Among the special features are the basics that you'd expect. G530 AWT GPS, Silver Crown radio stack and KFC 150 AP/FD have all been updated from the previous Letter of Approval. For the first time, the XSPEC 142 is even available with Electric and/or Manual trim. One of the most affordable and valuable simulators ever made has just become better. XSPEC Aviation specializes in remanufacturing pre May-2008 Flight Simulators (AST / FRASCA). They build training devices with the latest in modern technology on rebuilt AST/FRASCA cores. Because the hardware is rebuilt, they are able to provide a very high quality training device at a much lower price than a new simulator. XSPEC Aviation has an excellent reputation for quality customer support, an unmatched two-year warranty and lifetime remote assistance technical support. To contact XSPEC Aviation, visit http://xspecaviation.com, call 479-715-9514 or find them on Facebook. (C) XSPEC Aviation LLC 2018. All rights reserved. XSPEC Aviation is not associated with Frasca Intl. FRASCA and all likenesses are property of Frasca Intl. Published 8/17/18 property of XSPEC Aviation. 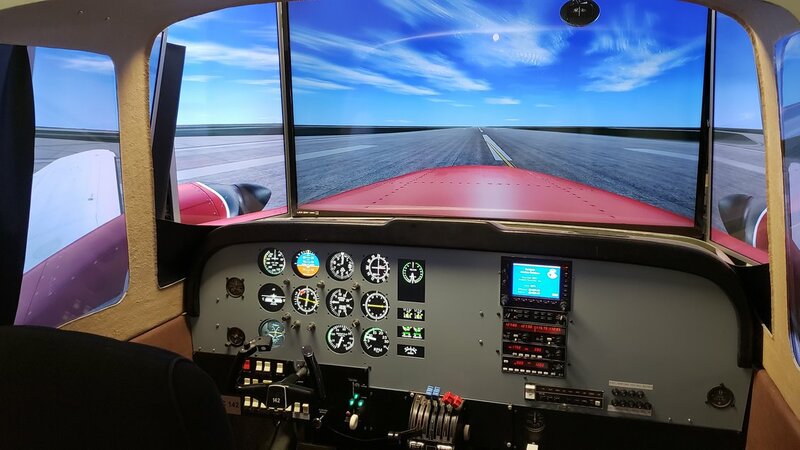 Flight Simulator manufacturer XSPEC Aviation drops prices to reduce negative training via unapproved devices in flight schools. Many flight schools across the country are providing quality, effective flight training via FAA approved devices for their students. However, a disturbing trend is beginning to occur as owners try to cut costs; often at their students’ expense. 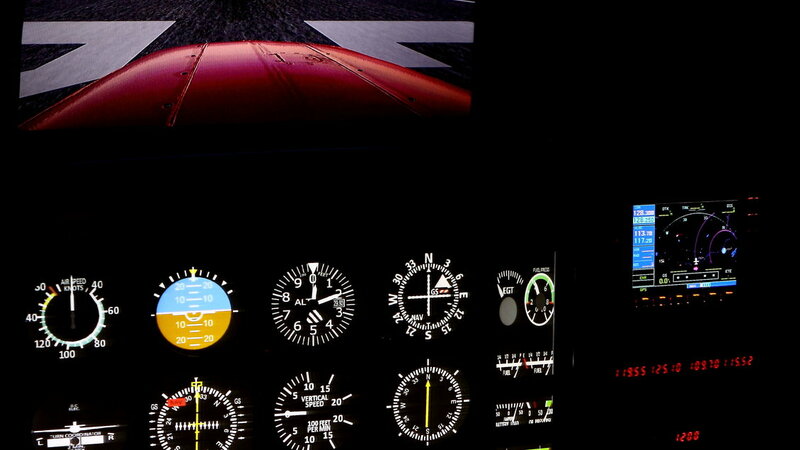 Most flight schools see the value in using flight simulation in teaching students the muscle memory they need to become proficient pilots in an immersive, low-stress environment. However, some flight schools have begun to build “do-it-yourself” simulators to reduce operating costs for their business. While this may seem lucrative at first, the result is a waste of money and worse; fosters negative training. It’s always been known that it’s the owners’ responsibility to maintain his flight school and its’ aircraft, keeping the fleet current with all FAA Regulations; is of the utmost importance. Anytime you go cheap in aviation you’re asking for trouble; whether you are thousands of feet in the air or doing the ground training. Today, it’s possible to buy almost everything you need to build your own “flight simulator” on the internet. 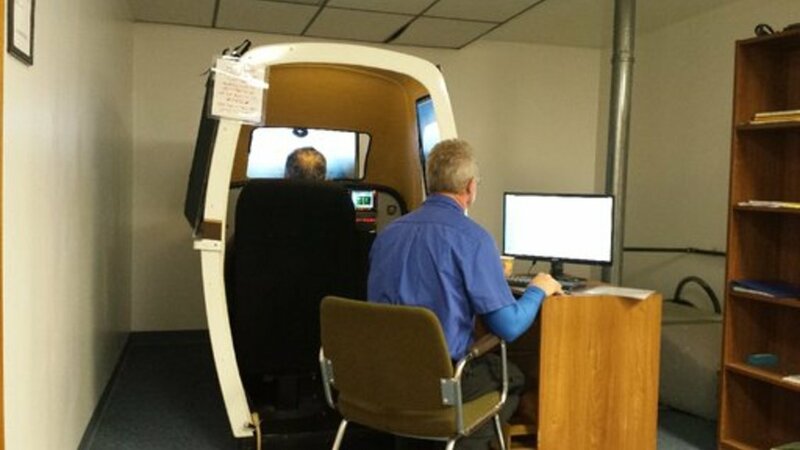 While it’s obvious that you would never do this while building actual aircraft for real-world flight training; it’s becoming a trend to do this with flight simulation. 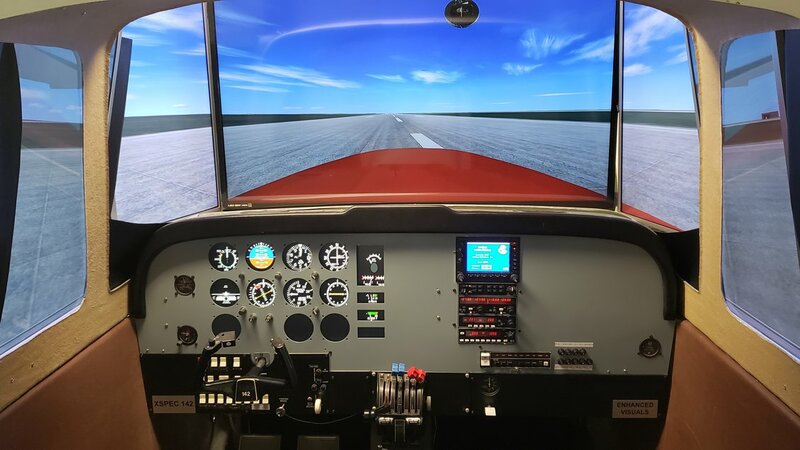 This creates an environment of negative training, as were noticed more flight instructors actually preferring students who have never used a home build desktop simulator. “We’ve seen students come in and say, ‘I have 1000 hours in the air’, only to realize they’re speaking of their computer at home with a joystick and Microsoft Flight Simulator, those are my real problem students.” says Doug G. CFII at one the east coasts’ largest and most premier flight training centers. It’s always been known that serious training requires serious equipment; which involves a myriad of FAA approvals, qualifications and certifications. Negative training from “do-it-yourself” simulators in a Part 61 or 141 flight school can result in lawsuits, property damage, personal injury or even loss of life. We feel here at XSPEC Aviation; that it’s our responsibility to help fix this epidemic in flight training. That’s why we’re doing our part by making it possible for everyone to afford FAA Approved, quality flight simulation in 2018. By dropping $11,000 off our already competitive retail price, we’re narrowing the price between off the shelf products and approved training devices. By making it easier for flight schools to afford AATDs; we’re eliminating inaccurate simulation in the flight training environment. Instead of wasting thousands of dollars on internet toys, you can invest in an XSPEC simulator; which will provide ROI in a way that is not possible otherwise. Unlike the simulator ‘some guy’ built off the internet; AATDs (Advanced Aviation Training Devices) are approved to log hours towards actual real-world flight training, up to 20 for instrument rating (61.65) and 50 hours towards commercial pilot certificate (61.129) just to name a couple. The FAA (Federal Aviation Administration) knows the difference between the two, and work hard to make sure that devices that are not representative of positive training for the aircraft are not used for actual flight training. Savvy owners like Ron E. use an AATD (Advanced Aviation Training Device) to keep his instructors and pilots current, as well as many other simulated flight scenarios. These combined hours save hundreds of hours of actual flight time, keeping aircraft maintenance costs as low as possible. Investing in the right AATD (Advance Aviation Training Device) is important, and will prove to be one of the most valuable investments your flight school can ever make. Choosing to build your own flight simulator on the other hand, will certainly be a waste of time and money for both you and the student. When your flight school needs accurate, affordable flight training simulation- you should only ask one question… Does the simulator look like my aircraft? When you compare the XSPEC 142 to the Redbird SD or PFC DCX MAX, you’ll see a myriad of negative training elements that should be avoided in your flight training experience. The Redbird SD has a thick ‘coffee table’ glass instrument panel where elements are represented solely as a graphic on the LCD screen. The PFC DCX MAX has instrument knobs in the wrong place. There is a reason for both issues however, and we’ve addressed it with the XSPEC 142. Manufacturers are trying to increase profits, and in doing so have strayed away from high quality components that are typically made of metal- like the instrument panel. Our instrument panels are made from a custom aluminum allow to be very sturdy and lightweight, for that real aircraft feel. Our instruments are the appropriate size and position, along with a convincing radios stack; the training in an XSPEC 142 allows for a smoother transition to an actual aircraft. When you consider all the advantages, combined with the reduction in pricing- the time to invest in an XSPEC Aviation training device has never been more sensible. We believe our clients do not need their products to be priced “reassuringly high” to realize quality when they see it; as our clients are among the most intelligent people in the industry. XSPEC Aviation has an excellent reputation for FRASCA repair, quality customer support, an unmatched two-year warranty and lifetime remote assistance technical support. To contact XSPEC Aviation, visit http://xspecaviation.com, call 479-715-9514 or find them on Facebook. Ron Emond is always looking for ways to improve the education and the value proposition for Air Direct Airways students. And like most aviation companies, partnerships play a part in their success. An important part of that strategy is to ensure that each of the aircraft models on the flight line are also available to fly “virtually” in their XSPEC 142 simulator. This arrangement is made possible because of the relationship between Air Direct Airways, the Nashua Pilot Shop, and XSPEC Aviation Flight Training Simulators. Students can also save files and share specific scenarios with an instructor. Air Direct Airways flight line: Air Direct Airways fleet includes the ubiquitous Cessna 172 “Skyhawk” for elementary flight training, the Cessna 172RG “Cutlass” for complex endorsements and banner flying, the Beechcraft “Dutchess” BE-76 for multiengine training, and the American Champion 7GCAA “Citabria” for tail wheel endorsements, aerobatics and aerobatic training. Each of these aircraft is completely represented in the sim, including all of the knobs and controls, so that students have a complete learning experience. 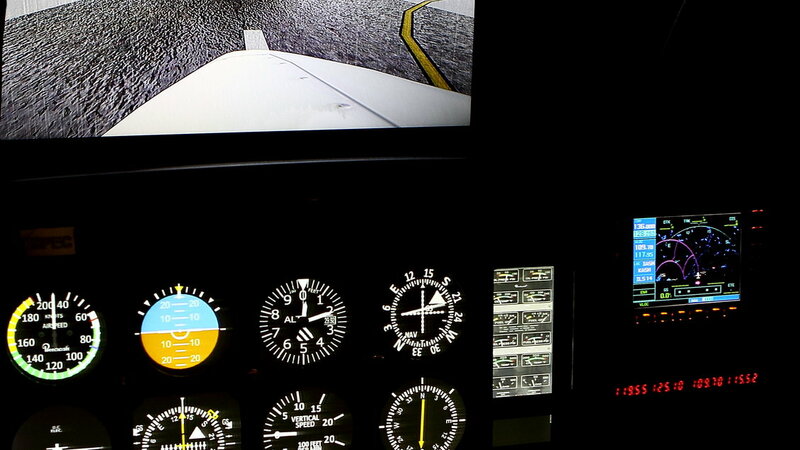 Since the sim includes the same controls as the actual aircraft, students are able to have a realistic practice session, and become much more confident the next time they climb into the cockpit. 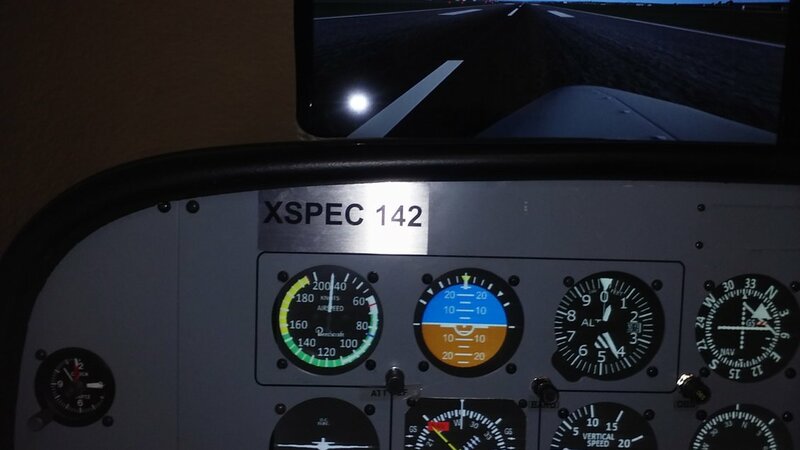 Unlike most simulators, the XSPEC 142 is capable of providing a complete Instrument Proficiency Check (IPC), including circle to land procedures. 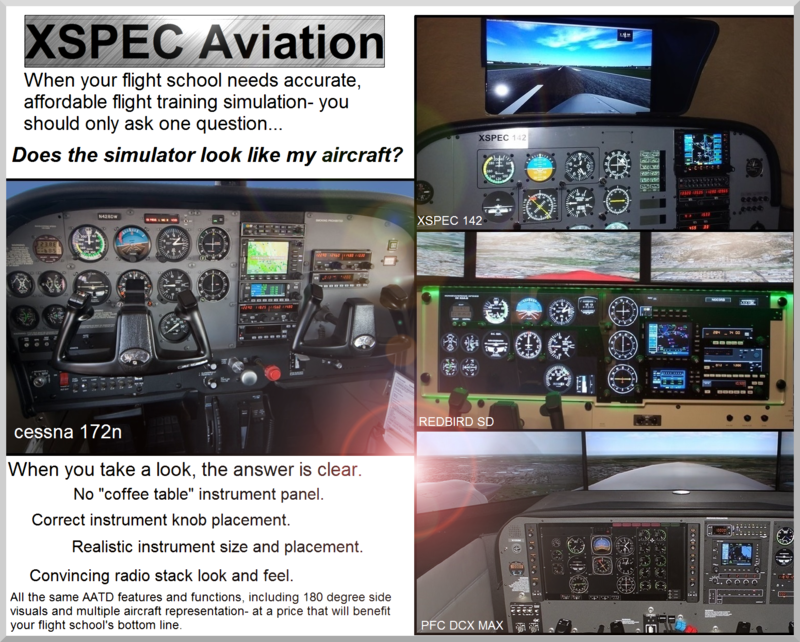 XSPEC Aviation simulator saves students time and money by providing full functioning up to and including circle-to-land instrument procedures. A large part of flight training involves muscle memory. “The immersion program is unique, we get students flying nearly every day,” notes Emond, making reference to the need to develop those physical skills. It can be helpful for the student to interact with the equipment in the same way as the “real” aircraft. Many sims have a flat glass panel, including radio controls that are represented as LCD graphics. The XSPEC 142 has a metal dash panel with knobs that provide tactile feel and feedback. Thorough preparation for each hour of flight time reduces the workload and expense on the flight school’s most expensive activity – flight time in actual aircraft. 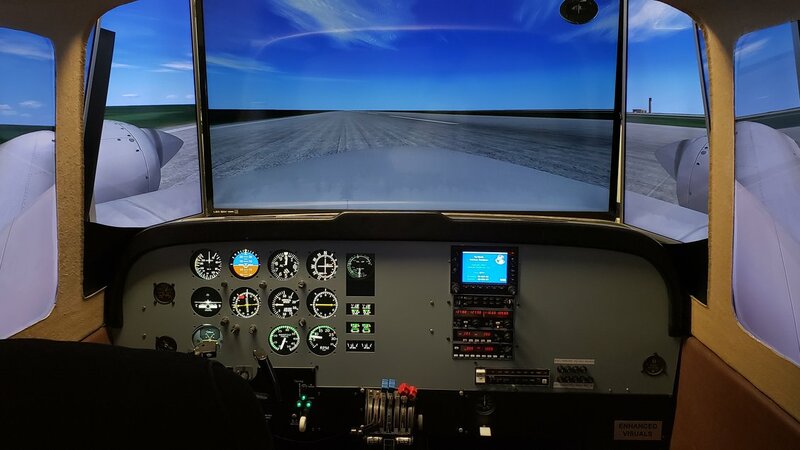 Simulators can be an enormous competitive advantage for a flight school to attract and retain students and keep a reputation for a quality, cost-effective training program. The Redbird SD simulator retails for $42,800. By contrast, a new XSPEC 142 can be purchased for $39,800 without a trade-in. 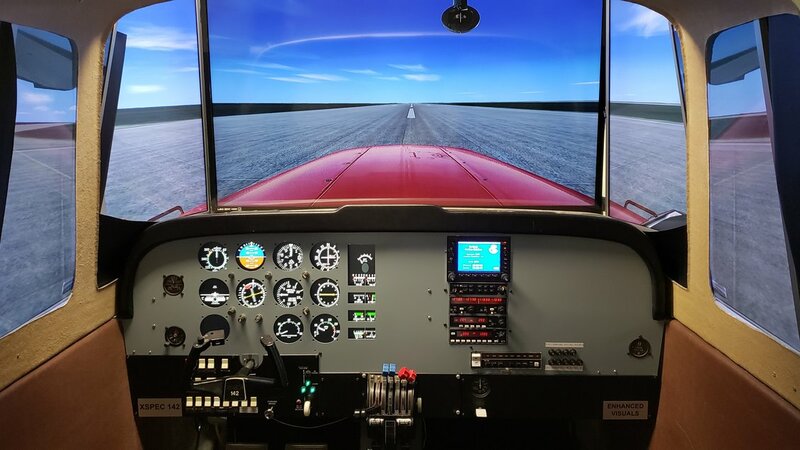 flight schools trading in an old “sim core” can expect to save $5000 on the cost of an XSPEC 142, which brings the cost of an XSPEC 142 to $34,800, including two-way shipping, warrantee and service. In-house financing is available for either option. Flight schools have many fixed expenses, including airport lease fees, aircraft, maintenance, instructor salaries and insurance; while their income may be seasonal or variable as students come and go. XSPEC provides affordability that suits the school’s cash flow, as well as a warrantee that reduces their risk on the investment in a simulator. The Redbird SD does not offer in-house financing, and has a one-year warrantee. The XSPEC 142 does offer in-house financing and a two-year warrantee. A great warrantee is important to flight schools because students don’t pay for sim time if the machine is broken or out of commission. Bill and Aaron Hill of XSPEC Aviation take the well-being of their sims and their clients very seriously. And they have become partners with the natural collegiality of aviators between Air Direct Airways and the nearby Nashua Pilot Shop. Air Direct started as a charter company in the 90s, but their old airport was turned into a golf course, they moved to Nashua and instructors began offering flight training under FAA Part 61. The company obtained certification under FAA Part 141 as a complete flight training organization about five years ago. A program with a major area university is underway that will provide students the opportunity to participate in a full-immersion flight training program. Students will spend most of their time in their first year completing flight training, obtaining ratings, and becoming eligible to work as flight instructors or charter pilots. Once they earn the appropriate ratings, students can begin earning money and building time to qualify for ATP certification as they work toward their Bachelor of Science. XSPEC Aviation is a flight simulator manufacturer that specializes in remanufacturing pre May-2008 Flight Simulators (AST / FRASCA). They build training devices with the latest in modern technology on rebuilt AST/FRASCA cores. Because the hardware is rebuilt, they are able to provide a very high quality training device at a much lower price than a new simulator. Used intelligently, "sim time" can help students learn and remember skills much more effectively than books or "chair flying" alone. Thorough preparation for each hour of flight time reduces the workload and expense on the flight school’s most expensive activity – flight time in actual aircraft. 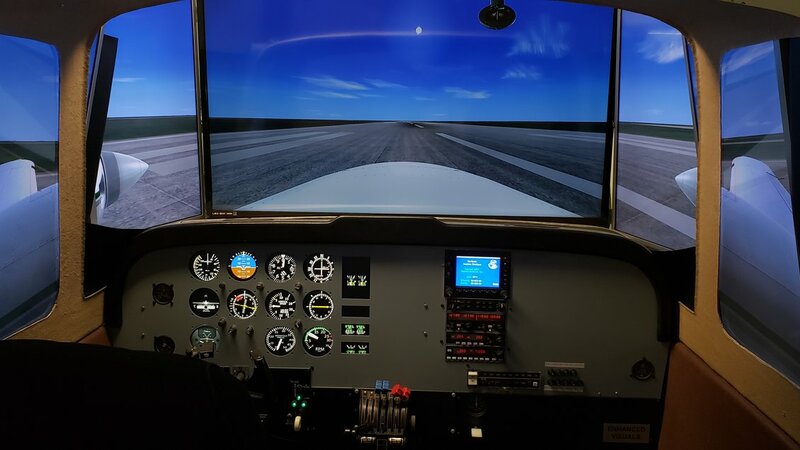 Simulators can be an enormous competitive advantage for a flight school to attract and retain students and keep a reputation for a quality, cost-effective training program. 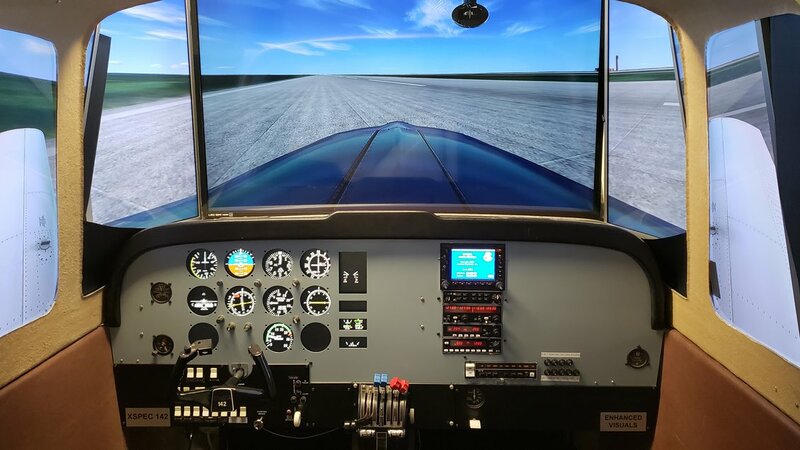 Since flight schools depend on fees from incoming students and tend to have many expenses, including aircraft, maintenance, instructor salaries and insurance, it is important that a simulator have easy, flexible affordability that suits the school’s cash flow, and a warranty that reduces their risk on the investment in a simulator. The Redbird SD does not offer in-house financing, and has a one-year warranty. The XSPEC 142 does offer in-house financing and a two-year warranty. A great warranty is important to flight schools because students don’t pay for sim time if the machine is broken or out of commission. 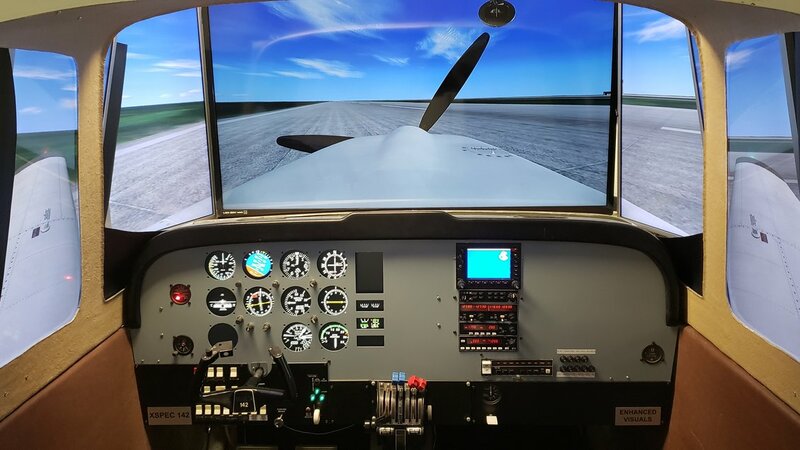 Flight schools trading in an old “sim core” can expect to save $5000 on the cost of an XSPEC 142, which brings the cost of an XSPEC 142 to $34,800, including two-way shipping, warranty and service. A new XSPEC 142 can be purchased for $39,800 without a trade-in. In-house financing is available for either option. Coming soon; the XSPEC 3000 is a high-quality flight simulator featuring 3-axis force loading built on the popular AST 3000/HAWK core. Available for your flight school, contact us for more details.